Amyotrophic Lateral Sclerosis was commonly known as Lou Gehrig's disease until August 2014 when the Ice Bucket Challenge phenomenon made ALS a household name around the world. ALS was recognized as a disease and given the name by French neurologist Jean-Martin Charcot in 1874. There is no known cause and no effective medical treatment or cure. ALS is a neurodegenerative condition thought to be caused by a breakdown of cellular recycling systems in the neurons of the spinal cord and brain that results in the nervous system slowly losing its ability to carry brain signals to the body's muscular system. Without those signals, a person with ALS (pALS) slowly loses the ability to control voluntary movement of their body, typically over a period of 2 to 5 years. ALS is a progressive condition that begins with mild weakness either in the hands or the feet, called limb onset, or with a difficulty speaking or swallowing, known as bulbar onset. Rarely, respiratory onset is indicated by difficulty breathing as the first symptom. Whichever symptom is first, most pALS will eventually experience all of them and more. In its later stages, pALS are completely paralyzed and unable to speak, swallow, or breathe on their own. Without technological intervention, ALS is invariably fatal with most affected people dying of respiratory compromise and pneumonia. ALS is not inherently fatal but death is usually a complication of the diaphragm becoming too weak for the lungs to function. Sensory nervous systems are generally spared as is the autonomic nervous system that controls involuntary muscles such as the heart and digestive system. In rare cases, ALS is accompanied by dementia, but usually pALS remain cognizant and are fully able to feel, see, hear, smell, and taste everything as their body wastes away from lack of use. Movement of the eyes is the only voluntary movement that is usually spared. Only about 10% of pALS have a genetically inherited form of ALS, or familial ALS. 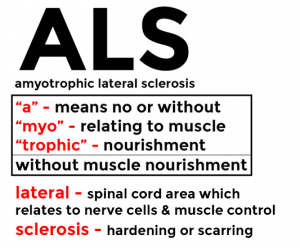 The other 90% who develop the condition for no known reason are known as having sporadic ALS. There is no medical treatment or cure for ALS. The first FDA approved drug called Riluzole in late 1995 that makes no significant claim of benefit. In early 2017, FDA approved a second drug called Radicava. It is hoped to slow the progression of ALS but no claimed benefit has yet been made. The only significant improvement in the quality of life for pALS in the 140+ years that ALS has been researched has been through the use of technology. Most of the physical symptoms brought on by ALS can be mitigated through mechanical or computerized devices that can be fully controlled by even a nearly locked-in individual. Through proper use of applied technology, ALS is a survivable condition that makes possible an engaged and productive life. The ALS Residences demonstrate that ALS is not invariably fatal as is often, and incorrectly, reported. Until medicine proves otherwise technology IS the cure. "ALS is no picnic but neither is it a death sentence"